'Tis the season to eat pumpkins. Making your own puree for pie, soups, and baking is a simple and delicious. Here's how: Choose your pumpkin. Pie pumpkins have the richest flavor but you can do this with any pumpkin if you wish. Remove the innards. I like to use a grapefruit spoon because the serrated edge helps cut through the stringy bits. 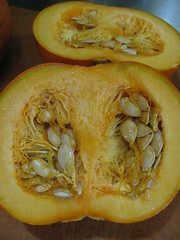 You can reserve seeds for roasted pumpkin seeds or garden planting if you wish. Place halves skin side up on a sheet pan. 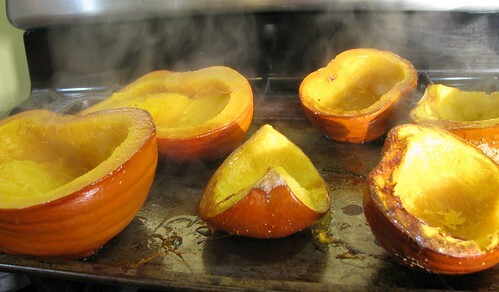 Roast in a 350 degree oven for 30 -60 minutes depending on the size of your pumpkin. 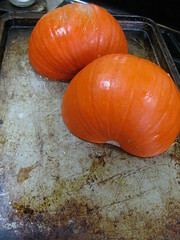 You will know they are done when the pumpkins are soft to the touch and look deflated like below. Flip over and allow to cool. 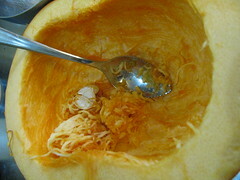 Remove the skin from the roasted pumpkin. For a finer product, puree with a food mill or blender. Use immediately or prepare to store in the freezer. 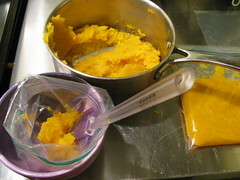 If you are really wise (I was not) you can measure the puree now and mark quantity on the outside of the freezer bag. Seal and place flat in the freezer. 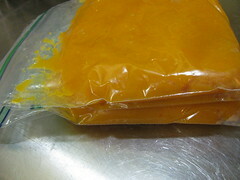 Puree will keep in the freezer for up to 12 months. Simply put in a bowl of water to thaw before use. 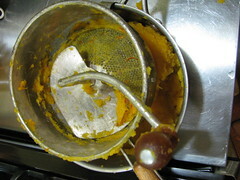 Making pumpkin puree is not necessarily more economical than purchasing it. A 15 ounce can of organic pumpkin puree is $2.79 at my local gourmet store; that's $0.19 per ounce. 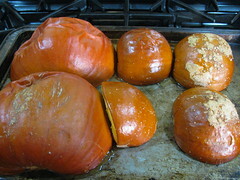 I paid $6.50 for these three pie pumpkins and measured 2 pounds 8 ounces weight of the three packages of puree. Hand made puree was, therefore, $0.16 per ounce. A tiny savings, but not much really. Economy comes into play if I grow my own pumpkins, which I plan to do next year. The pumpkins will then cost very little, especially because I swiped seeds from the organic pie pumpkins. Even without huge cost savings, puree is so easy that it's worth my effort. I control the quality of the puree, homemade is less processed and therefore probably retains more nutrients, and it supports local farmers by buying pumpkins directly from them.